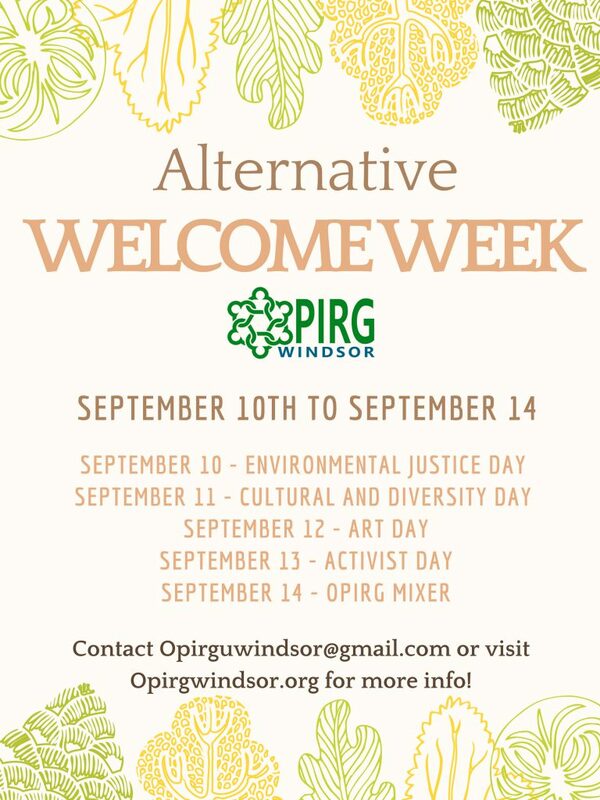 Also known as Alternative Welcome Week (AWW), offers 100% FREE events to introduce students to the dynamic social, environmental and political movements in our beautiful city of Windsor, both on and off campus. This includes things like local music, food, fair trade coffee and events to encourage students to be active at all levels of society – from forming friendships and student groups on campus, to networking with community members and organizations that may have resources and volunteering opportunities that will serve to strengthen your resume and help those applying to jobs or post-graduate programs. Some of the representatives attending are Community Legal Aid, Windsor Essex County Environment Committee, TEDxUniversityofWindsor, etc. Some of the workshops will be hosted by Professor Reem Bahdi presenting on Access to Justice for Palestinians, the young adult, fiction author – Dr. Sarah Raughley, movie director and writer – Michael Stasko, and MUCH more. There will also be a huge social mixer on September 14th with FREE food and beverages, so come on out! The Campus Community Garden is dedicated to building healthy, interactive urban communities through the collective production of locally grown, organic food. Windsor Animal Allies will discuss carnism, vegetarianism, veganism, and what effects our personal choices have on the planet. The Citizens Environment Alliance (CEA) is a non-profit, grass-roots, international, education and research organization. They are committed to an ecosystem approach to environmental planning and management. The Bulimia Anorexia Nervosa Association (BANA) is a not-for-profit, registered charity, community-based organization. Since 1983, they’ve been committed to the provision of specialized treatment, education and support services for individuals affected directly and indirectly by eating disorders. Meal Exchange coordinates the student movement to transform food on Canada’s campuses. The Nigerian Students’ Association at the University of Windsor. Writer, Producer, Director for “The Control” a feature film currently in post-production, release slated for 2017. He will be hosting a discussion on his post-modern sci-fi thriller shot entirely in Windsor, ON., with participation of The University of Windsor’s Communication, Media and Film program. Over 25 Windsor students and another 15 local Windsorites on crew. The Arts Council Windsor & Region (ACWR) is a non-profit organization that serves all disciplines of individual artists, arts organizations and non-arts partners in promoting, developing and realizing creative activity. Art Gallery of Windsor’s mission is to create experiences for people where artistic expression is discovered, encouraged, enjoyed and valued in an international border community. In the spirit of ideas worth spreading, TEDxUniversityofWindsor is a local, student-organized event that brings people together to share a TED-like experience. We strive to spark deep discussion and connection in a small group of leaders inside the city Windsor. Community Legal Aid is a joint project of the University of Windsor, Faculty of Law and Legal Aid Ontario. They provide legal services for low-income residents of Windsor-Essex county or full-time University of Windsor undergraduate students. Their clinic serves as a learning environment for law students to build their advocacy and litigation skills, while providing necessary legal services to our community. Occupy, Ferguson, Standing Rock, Charlottesville, #J20, the G8/G20 summits; more and more we see political activists being targeted for arrest. Police often rely on the fear induced by [potential] arrest to force compliance, civil obedience and passivity. Learn to resist the fear of arrest by increasing awareness and knowledge of how it is to be arrested in the context of political activism. Learn about your [theoretical] rights at demonstrations and during interaction with police, common charges, the pros/cons of intentional arrests [like we’ve seen on Burnaby Mountain and elsewhere], as well as why and how we might be able to avoid it. The hope is that by sharing information and experiences, individuals will be more prepared and empowered to take action themselves to do what’s needed, and what’s right – even when it may involve risk. Professor Fabre will be hosting a 2-hour workshop based on Decolonization in Action with co-facilitator, Beth Cook, who is Anishinaabe Kwe Bkejwanong First Nation who does work on decolonizing education. This workshop will be facilitated in a circle in the Rose Room of Vanier Hall. Professor Bahdi joined the Faculty of Law in 2002. Her current research focuses on two areas. The first concentrates on the human rights dimensions of national security laws and policies in Canada. The second focuses on access to justice in the Palestinian context. 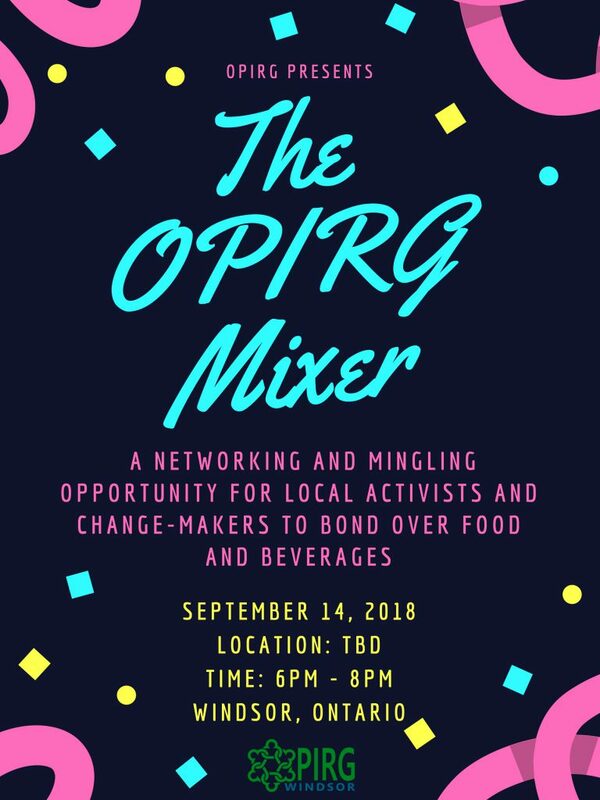 At this mixer, you will have the opportunity to network with fellow Windsorites, activists/changemakers, and any representatives from local organizations that may attend. There will be FREE food and beverages, so if you don’t come for the networking, at least come for the snacks!